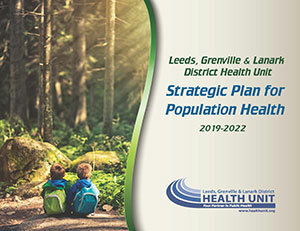 The Leeds, Grenville and Lanark District Health Unit is pleased to announce the development of its 2019–2022 Strategic Plan. This plan is guided by the Ontario Public Health Standards, Leeds, Grenville and Lanark population health data, research evidence, and our knowledge of, and experience working with our communities. We will continue to work together with our partners on these common areas of focus: Health Equity; Healthy Infants and Children; Healthy Youth; Healthy Communities; Infectious Diseases. For all ages, promoting and protecting health is essential for growth and development, learning, working, playing, relationships, and for community cohesion and sustainability. As stated by the World Health Organization in the Ottawa Charter on Health Promotion “health is a resource for living – the ability to identify and realize aspirations, satisfy needs, and cope with the changing environment”. Check out the 2019–2022 Strategic Plan. For more detailed information on our programs and services, and many important topics mentioned in this plan, visit our website. We also provide Information on the Health of the Population in Leeds, Grenville and Lanark.